'MLM' The American Dream Made Nightmare: Robert FitzPatrick - The Orwellian response of the 'Herbalife(HLF)' mob to the FTC's continued moral relativism. Robert FitzPatrick - The Orwellian response of the 'Herbalife(HLF)' mob to the FTC's continued moral relativism. Lack of a "pyramid scheme" charge has been cited for Wall Street's ignoring the FTC settlement and continuing to back Herbalife. Some accepted Herbalife's Orwellian claim it was "exonerated.". The actual reason for Wall Street's and Herbalife's ridicule of the FTC is the agency did not confront the cause of Herbalife wrongdoing, its unlimited income promise with pay-to-play requirements. The FTC's failure to acknowledge the root cause of Herbalife wrongdoing was a "tell" to investors that the FTC would not challenge the MLM lobby. They've bet on Herbalife's escape. As cause for the FTC's silence in the face of Herbalife's and Wall Street's scorn some also note FTC Commissioners and officials using MLM as a lucrative post-government career destination. Wall Street's bet against the FTC may be wrong if Herbalife must prove retail sales. The true facts about Herbalife's recruiting scheme could compel FTC law enforcement. Three months have passed since the FTC presented its formal Complaint against Herbalife (NYSE:HLF), following a two-year investigation. The Complaint detailed pervasive deception and extensive consumer harm, i.e., unfair and deceptive trade practices under Section 5 of the FTC Act. Some have focused on the absence of the term "pyramid scheme" in the FTC statement. Actually, the FTC vividly described the workings of a Herbalife pyramid scheme - payments related to recruiting, financial losses and churning rates of participants, false income promises, and absence of retail profits. Not naming or attempting to prove a pyramid scheme is a legal strategy, also recently used by the Dept. of Justice in criminal fraud charges against the CEO of the MLM, Zeek Rewards. Pyramid schemes are complex "long cons" and there is no federal law against them. Section 5 infractions are much easier to prove. It was not the avoidance of "pyramid scheme" that is significant but rather the FTC's omission of the underlying foundation of a pyramid scheme, the well spring and the cause of Herbalife's deception and consumer losses. This underlying and uneconomic factor defeats, from the start, any chance of retail sales, and always produces 99% loss rates. That factor is Herbalife's "unlimited income" promises based on its "endless chain" structure. The endless chain income promise, the most fundamental of all elements of a pyramid scheme, is the factor the FTC does not name because, officially, it endorses this endless chain proposition in its endorsement of "legitimate multi-level marketing", aka "MLM." Herbalife, for its part, does not - and cannot - in any way try to hide or deny its endless chain model. It is proclaimed as a legal and normal pillar of commerce, passing GAAP and regulatory standards. Herbalife defends the "endless chain" as the foundation of its pay plan and its recruiting activities and the hallmark of the business sector shared with hundreds of others of its type, "multi-level marketing." In the FTC case against Herbalife, the archetype of MLM, deception and consumer losses were singled out for FTC action. Yet, because the unrestricted endless chain is permitted by the FTC in its endorsement of MLM, the agency dared not speak of the "causes" of Herbalife's global law breaking. The wrongdoing is named, but motive and opportunity are not referenced? Instead, Herbalife was said to be, in some unexplained way, endemicallyfraudulent, requiring "restructuring" to "start operating legitimately." What then did cause Herbalife, among its MLM peers, to do such bad things and warrant FTC action? While the cause of the illegal practices was not named, the FTC did indicate what were not the causes. It was not due to a ringleader. None was named, like the CEO was in the MLM, Zeek Rewards. It was not accounting malfeasance, as in Crazy Eddy's and Enron. The SEC has not weighed in. It wasn't "rogue" salespeople or complicit managers, who took the fall at Wells Fargo bank. The Consumer Financial Protection Bureau remains silent. Herbalife's wrongdoing, the FTC stated, was embedded in its compensation formula and expressed in its core mission. For this premise to be true, Herbalife must be the ultimate "rogue" MLM, yet the FTC did not claim this either or argue that Herbalife was harming its fellow MLMs. Even though the operation of a "pyramid scheme" was not claimed and the causal factor underlying the FTC's list of Herbalife misdeeds was not named, it still would be reasonable that Wall Street analysts and the financial news media would dig deeply into the FTC's condemnations of Herbalife that led to a huge fine and major corrections. As we know, none of that happened. Instead, Wall Street, and its news media minions, were captivated by Herbalife's stunning, Orwellian response that the FTC's Complaint-Settlement was not an order for fundamental restructuring at all but instead was a government exoneration and vindication of its existing"MLM" business model. The FTC's litany of specific Herbalife wrongdoings and the punishing measures imposed on Herbalife for it to be allowed to stay in business, including disgorgement of $200 million, were ignored as if they did not exist. Astute observers have looked past Herbalife's mind-boggling but still predictable denials, and even the media's (also predictable) compliance. They wondered how and why the FTC would allow its own findings and official actions to be publicly negated, grossly misrepresented and misused by a company it had just prosecuted for deceiving consumers! I submit that the explanation for Wall Street's defiant repudiation of facts and scorning of the FTC is the same factor that also accounts for the FTC's own self-destructive silence while its prosecutorial work is publicly trashed and the Defendant moons the Commission's authority. The common factor is that the FTC did not and, apparently, feels it cannot address the main and central fraud involved in the Herbalife case, the endless chain income proposition. It is this position that undercuts the entire prosecution and has led some speculators to bet against FTC enforcement. The FTC's revealing failure to acknowledge Herbalife's fundamental flimflam, on which is based its "infinite" structure and "unlimited" income promises, as well as being the root cause of the consumer losses was the "tell" for some on Wall Street of the government's unwillingness to cage the beast it had poked, the beast called "multi-level marketing." The FTC's failure to acknowledge the very nature of the scam gives evidence to some on Wall Street that the "settlement" will follow the FTC's historic - since 1980 - acceptance of MLM as politically insulated from law enforcement by "influenced" members of Congress and, besides that, because MLM is a lucrative career destination for some FTC Commissioners and officials. Eileen Harrington, FTC Bureau of Consumer Protection (1987-2009), "with direct responsibility for the FTC's enforcement and regulatory oversight of business opportunities like Herbalife." FTC Commissioner Julie Brill recently resigned to join the law firm of Hogan and Lovells, a firm that lists Amway and the Direct Selling Association among its clients, and in which partner Deborah Ashford is General Counsel to the DSA "Education" Foundation of which former FTC Commissioner and now Herbalife employee, Pamela Jones Harbour, is a board member. Hogan and Lovells, where Commissioner Brill now works, also filed an amicus brief,opposing the FTC in its case against the MLM, Burnlounge. FTC, Director of the Bureau of Competition, Richard Feinstein, returned to the law firm, Boies Schiller Flexner, soon after the firm was retained by Herbalife in 2012. Feinstein was appointed to his position at the FTC in 2009 by Commission Chair, Jon Leibowitz, who is now on Herbalife's payroll. Feinstein has moved back and forth between the Boies Schiller and the FTC several times. Boies Schiller recently helped Herbalife fight revelations by short-seller Pershing Capital and to secure a quick and minuscule cash settlement in the most recent consumer class action case of pyramid scheme charges against Herbalife. The "endless chain" is the genesis of all pyramid and ponzi schemes and various other swindles. In the world of "business opportunity" solicitations a perpetual endless chain income promise is equivalent to what a perpetual-motion-machine would be in patents and inventions. Unlike the complex factors involved in a "pyramid scheme" racket, the fraudulence of a perpetual endless chain income promise is pure and recognizable. By its very nature, it meets the conventional definition of fraud: deliberate deception to secure unfair or unlawful gain. At Herbalife, in classic MLM fashion, this recruiting-based proposition is codified in a contractual agreement with participants of advance-fee collection (fees and quotas of product purchases) with promised rewards (bonuses and royalties) payable upon the perpetual recruiting of new contractors under the same terms, with the new investments serving as funds for the promised reward to the recruiters. This proposition is then marketed as a viable livelihood for millions of people. In its Complaint and Settlement, the FTC went beyond choosing not to prove Herbalife is a pyramid scheme. It chose to leave out any reference to the source of the racket from which all the itemized wrongdoings and abuses flow, including a definable status of "pyramid scheme." Ignoring the beating heart of the Herbalife scam - the continuous endless chain income promise - gave this classic tool of fraudsters the status of a legal, normal and matter-of-fact business "incentive." Like Herbalife's astonishing claim of FTC exoneration, the FTC's treatment of the Herbalife "endless chain" created its own reversal of reality. Omission implied legitimacy and viability to this classic trickery. Thus, to bring charges against Herbalife, the FTC had to claim Herbalife had misused the endless chain pay plan and structure of "legitimate MLM", as if a continuous endless chain income promise to all could possibly operate honestly and fairly and really could deliver its promised benefits to all who pay and participate! As an almost magical force capable of mesmerizing millions, the MLM version of the endless chain promise is never denied by Herbalife, but its shifty and voracious countenance is prudently covered with a mask, called "direct selling." In this disguise, the siphoning of money from doomed participants at the bottom is sanitized through product purchases to mimic ordinary consumer transactions and divert attention from the "incentivizing" role of the endless chain promise. The products operate like chips in Las Vegas or a form of crypto-currency, like Bitcoin. Between 35% and 55% of the price of the chips (products) is transferred to the chain of recruiters, with the majority of that total allocated by formula to those in the top 1% of the chain. With two years of fact-finding, aided by whistle-blowers, independent researchers and consumer activists and with the whole world watching, the FTC had a historic opportunity to escape its political leash by merely acknowledging and describing the foundation of Herbalife's business model. It could have explained and illustrated how the endless chain income proposition itself compels the marketing program toward recruiting and thereby snuffs out retail sales potential. It could have shown how it produces by design, 99% consumer loss rates year after year and necessitates cover-up "disclosures." Instead, the FTC chose to treat the "infinity" aspect of the proposition, an economic Unicorn, as if it really exists, while condemning its effects, as if they were preventable. To put the MLM endless chain proposition into perspective, it is useful to consider other areas of commercial activity where the endless chain income proposition, under certain conditions, can be legal and permissible or even harmless. These include lotteries, securities and chain letters. Lotteries, chain letters and securities-trading - due to their inherent risk and their win-lose nature and even when they are abused and operate criminally - do not portray themselves as viable Main Street "income opportunities" to replace higher education, trades, jobs and other business ventures. MLMs do exactly this. Due to the near total losses that lotteries must cause among virtually all participants, state governments oversee or directly operate them. Actual odds to win must be published. Accounting of revenue and rewards is strictly monitored. Most important, lotteries present themselves as games of chance, never as livelihoods to replace jobs. MLMs do exactly this. Securities must be registered with the SEC. The nature of a security in which value is dependent on future actions of other parties define them as "speculative", and thereby require government oversight. The floating value of a security, based ultimately on what the latest investors believe and will pay, without limit, and always vulnerable to manipulation, is offset by disclosure requirements, government monitoring, and independent analyses of revenue, earnings, book value, and the performance of comparable companies. Security-trading, even under regulation, disclosure rules, monitoring and analysis, does not portray itself as a replacement for jobs for millions of people. MLMs do exactly this. Only in the MLM version is the endless chain proposition permitted without registration, regulation, oversight and no disclosure requirements of any kind. Only in MLM is the endless chain allowed to be portrayed as a rational replacement for jobs for millions of people. Only in MLM is the investment in an endless chain proposition allowed to be to be called "risk free". MLM's endless chain marketplace, called the MLM "industry," is not studied by universities and its data are not gathered or monitored by any government agency. There are no independent data beyond those promoted by MLM's own PR and lobbying group, the Direct Selling Association, repeatedly shown to be skewed, exaggerated or at best "anecdotal." There are no independent analysts examining factors of saturation, competition, or historical performance for the investors (participants). If the MLM "distributorship" were a security, it would be an unregistered penny stock hyped in a boiler room by unlicensed brokers, manipulating the price and lining up buyers and sellers to kite the price. If MLM were a lottery it would be selling tickets to yesterday's drawing. If MLM were a chain letter, the persons at the top of the list would never be taken off as more people signed at the end and sent money to those listed above. The endless chain in business is potentially toxic by design and, history shows, if not regulated and monitored, it can destroy whole markets or even nations and it can lead individuals to insane and self-destructive actions. By its nature as a transfer, there is no equitable exchange of value. If you profit from it, someone else on the chain or perhaps many others did not. However, if no money is required to participate, the illusions and fantasies conjured by the income promises of an endless chain become only fanciful and rather innocent. Chain letters, the original endless chain schemes, exemplify this principle. When they charge money for participation, they are illegal in the United States. Why? It is their impossible reward promise based on an illusory "endless" structure. They are fraud per se. Herbalife's structure and income promise are based on that same model, understood to be inherently deceptive in a chain letter. Yet, at the press conference on Herbalife, the FTC suspended recognition of the inherentlydeceptive nature of Herbalife's structure and related income promise, and FTC officials lamented only that Herbalife did not fulfill its impossible income promises to participants. When chain letters do not charge money, but only solicit participants to sign on and then send the letter to potential new participants, they become harmless parlor games promising good fortune or offering the chance to spread a wise or silly admonition. The activating spark that makes an endless chain financially lethal is the "pay-to-play" component, sometimes called "payment of consideration." Yet, besides being unable to acknowledge Herbalife's dangerous endless chain proposition at its core, the FTC also could not take notice of the long and brightly colored fuse attached to the Herbalife explosive, the pay-to-play components built into the MLM pay plan. Herbalife, like all MLMs, is steeped in and totally dependent upon pay-to-play charges. The legal prohibition against chain letters charging money should be the guide for how the FTC can summarily stop Herbalife's law-breaking: prohibit Herbalife from charging money to participate in its illusory reward plan based on "endless" recruiting. Among Herbalife's pay-to-play costs are registration fees, but those are just the start and not the main ones. The modest registration fees for "startup kits" may be outside the reward plan and not exceed their base costs. The important pay-to-play charges are product purchase quotas to "qualify" for receiving recruiting-related rewards under the pay plan, then monthly maintenance of the qualifying purchase quotas. Personal buying can fulfill or top off the quotas. There are escalating purchase quotas for higher rewards which if not met, result in penalizing lower rates and lead to significant purchasing to avoid the penalty. Add to these, back office and website charges, shipping costs, marketing material purchases, seminar registrations, books, videos, and more. MLM's pay-to-play costs add up to thousands or tens of thousands of dollars for those who bite the hook attached to the end of the chain. The simple solution to deactivating MLM's financial IEDs is presented in twoSeeking Alpha articles, one by me, and one by attorney Douglas Brooks. The articles explain that to remove the danger the FTC would just need to prohibitpersonal purchases from being used as qualifiers or measures for recruiting-related rewards. Buying for personal use or for retail marketing purposes or for any other reason would be unaffected, but personal purchases would never count toward the buyer's own quota related to recruiting-related rewards. Everyone on the chain would be free to buy the goods, but personal buying would not help or hurt the buyers themselves regarding their future-oriented, recruiting-related rewards. With the fuse to the bomb removed, the FTC would then have no need to monitor "retail selling" rates, which is an after-effect of pay-to-play recruiting and which is impossible to do anyway. FTC monitors would just need to read the terms of the MLM's pay plan and enforce the prohibition against any pay-to-play provisions. Just as whistle-blower Harry Markopolos asked the SEC when he famously and unsuccessfully presented that agency with Madoff's impossible ROI data, consumer activists asked the FTC to look at Herbalife's math. The Herbalife income proposition is based upon continuous exponential expansion without regard to saturation. The promised success of each new MLM participant's investment is based upon a mathematical impossibility. "Infinite" expansion and the promise of "unlimited income" are obviously pseudo-economic phenomena. If the FTC had only recognized the implausible claims along with Herbalife's historical recruiting and payout data over multiple years, the investigation would be finished in short order. As Markopolos noted when he realized Madoffs' trading records had to be bogus, it only takes about 5 minutes to see such fraud. As we know, Herbalife's business, despite the absurd promises and the devastating data, or perhaps because of them, befuddle many people. I have explained and presented to countless journalists the runaway numbers in a typical MLM plan based on each participant recruiting just five others. After the 13th recruiting cycle, the earth's entire population is enrolled, if the chain is not broken. The numbers are indisputable, yet because the MLM scheme endures and continues to recruit, the numbers don't penetrate some minds. At that point, I turn to pyramid geometry and the work of the recently retired expert on pyramids at the FTC, Peter Vandernat. Dr. Vandernat left the agency with a trove of precise declarations including an explanation of the design of endless chains showing that financial disaster for millions of participant-investors is pre-ordained by the model itself. He wrote,"In a pyramid scheme the large scale failure to obtain the proposed rewards is not postponed until market saturation. For as long as a successful recruitment pattern is maintained, the names of the most recent recruits change over time, but the percentage of members constituting the most recent layers of recruits does not appreciably change. At whatever enrollment the program may be considered, whether the total membership be large or small, saturation or not, the rules and implementation of the program ensure that the vast majority of members are not in a position to obtain the proposed rewards. For the promoters of the scheme, this feature always limits the liability for required payouts, while also favoring relatively few participants who are at or near the top of the structure. This description is typically true for all stages of recruitment, including those stages that are still far from market saturation. Also, in a pyramid scheme the number of people who lose money increases exponentially for as long as a successful recruitment pattern is maintained. From the perspective of consumer protection, it is always better that a pyramid scheme fail sooner rather than later." 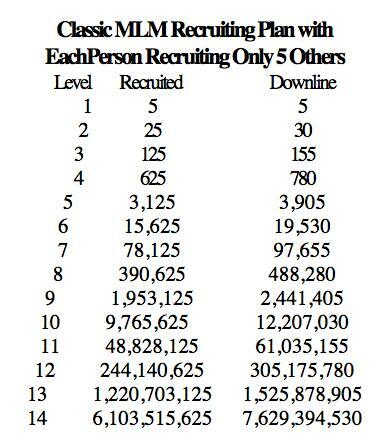 Applying his description to the "each get just 5" chart, it shows that the hapless and unprofitable recruits in the bottom two levels make up 96% of the total downline! Yet, even with the math calculations and Dr. Vandernat's explanation, the mystifying capacity of the MLM endless chain scheme to endure leads some otherwise perceptive individuals to swallow the "direct selling" narrative and ignore the recruiting reality. The math projections and the pyramid's malevolent design are often overwhelmed by reports of continued recruiting, pious denials of wrongdoing by well dressed MLM executives and scenes of ecstatic new recruits pouring into "extravaganza" recruiting rallies. The mind cannot easily hold those apparently positive images alongside the gruesome facts of 99% "losers", perjury about retail sales and 50-80% annual churn of "quitters." MLM persistence becomes an unfathomable mystery to some people. As in the Wizard of Oz or a Tony Robbins "fire walk", the explanation for the mystery is behind the curtain and through the smoke. In the MLM case, the saturation of whole populations that the recruiting model would seem to lead to is mitigated and managed - for the MLM enterprise - by Factor X, the undisclosed or obscured rates of quitting. In the "biz", the quitting pattern is called "breakage." Insiders understand breakage as the key to a MLM enterprise's longevity and a windfall to top recruiters. As lower-level recruiters finally quit, whatever residual revenue they may have created from recruiting flows to the levels above. At Herbalife, 66% of all rewards wind up in the hands of the top 1% of recruiters. This is no accident, but the planned result of a carefully formulated top-loaded reward plan with the upward transfer compounded by "breakage" which the plan's authors fully anticipate. Ironically, the fitful and profitless migration of millions of unwitting consumers joining and quitting MLMs constitutes MLM stability. The quitting keeps the MLM from imploding. The churn and loss rate are not signs of abuse of the MLM model but an integral and necessary part of it. The model is based, as all endless chains are, on transferring money within the chain from later participants to earlier ones. Each "winner" requires many losers, which leads to large-scale quitting. The fabled MLM income plan dazzles the new recruits with visions of an explosively growing downline - 5+25+125+625 = 780 in just 4 cycles! In reality, 70-80% of new recruits quit within a year as "failures" and most are unable or unwilling to recruit others. The entire chain turns over at a 60% rate. Recruiting often does not keep up with quitting. Only by invading more geography is the MLM enterprise able to show continued "growth". This "growth" is not from building upon a base but is only the net gain of relentless recruiting over constant quitting. Huge troughs of saturation and decline in established areas are papered over with "growth" in new areas, the classic "pop and drop." If it can replace its 60% of quitters, the MLM enterprise itself does not face "saturation." But the hundreds of thousands joining each year at the end of its "endless chain" are robbed blind by it. For any significant number among that huge base of new recruits to build large "downlines" is mathematically, demographically and economically impossible. They are doomed by design, and fated to lose from the start, as Dr. Vandernat explained. Saturation may be a distant forecast for the MLM enterprise itself, as long it can keep replacing quitters and expanding globally. The baffling and brutal consequences of saturation are "externalized" by the MLM scheme to all new recruits soon after the scheme is launched. Any significant number of recruits at the end cannot possibly "duplicate" the recruiting numbers of the "winners" on the extravaganza stage. Saturation for the participants is not a far-off event. It is the immediate and permanent MLM state. Constant "breakage", experienced as loss, disappointment, and self-blame among millions of "losers", is how the MLM manages saturation, while it proclaims another year of "growth." There is a critical data point that no one has ever seen and the FTC did not report, despite two years of fact-finding with subpoena power. If known, it would instantly reveal the savage impact of saturation on Herbalife recruits and the ill-gotten profit to the company and its top promoters. The data point may be expressed in this analytical question: How many people, in the USA for example, have ever become paying contractors (distributors) for Herbalife since it opened its doors in 1981? Out of all those millions of individuals, how many ever gained any net profit? If only 1% can be shown to be profitable during one year, the percentage of profitable participants among all who paid in over the last 35 years would be infinitesimal. The 1-percenters remain in place year after year while the 99-percenters churn and accumulate. The actual winners, stated as a percentage of the true total would be as close to zero as one could graphically illustrate. Could it be that the FTC does not know about the inherent fraudulence of anyendless chain allowed to operate unregulated and unmonitored? Does it really not have data on the historical destructiveness of MLM income propositions and "business opportunity" solicitations? Is it really unaware that MLM's "incentivize" personal purchases with recruiting-based rewards as stated in the compensation plan? Does it not see how its enforcement policies since 1980 have created a protected haven for the nation's only "endless chain" enterprise without regulation, disclosure or oversight? Does it really not know that the endless chain will, by geometric design, always produce massive loss rates, and that MLM schemes survive by churning and replacing 60% of the participants every year? Could it be that the FTC believes most MLMers make money from retailing? Does it think MLM retailing is even feasible, when the MLM enterprise perpetually inundates all areas with competitive "salespeople" and offerswholesale pricing to anyone breathing? Or could it be that the FTC - and many of us too - have forgotten? Are we like people under a dictatorship who forget what free speech and assembly are? Have we forgotten that an endless chain income proposition is inherently deceptive? Did we forget that law enforcement used to stop this kind of virally-spreading fraud from infecting commercial markets? "Unfair trade practice: The promotional use of a chain distributor scheme in connection with the solicitation of business investments from members of the public is an unfair trade practice under 100.20 Stats. When so used the scheme serves as a lure to improvident and uneconomical investment. Many small investors lack commercial expertise and anticipate unrealistic profits through use of the chance to further perpetuate a chain of distributors, without regard to actual market conditions affecting further distribution and sale of the property purchased by them or its market acceptance by final users or consumers. Substantial economic losses to participating distributors have occurred and will inevitably occur by reason of their reliance on perpetuation of the chain distributor scheme as a source of profit." Similar clearly-worded state statutes are in North Carolina and in California among others. Additionally, there are attorneys, regulators and economists to help with memory recovery. 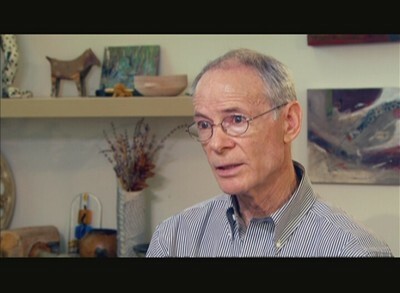 The author of the Wisconsin statute and regulations, Bruce Craig, retired Asst. Attorney General, continues to offer his experience and insights to the FTC, universities and the business media. Despite the FTC's conspicuous omission of the source of Herbalife's wrongdoings - its endless chain structure and compensation plan and the incendiary factor of "pay-to-play" purchasing - the FTC Settlement with Herbalife is a game-changer in one important way. Herbalife is to be required to show that 80% of all its sales are made to people who are not part of the pay plan, true end-users, outside the chain. Herbalife's model and reward plan are based on a closed market that focuses on recruiting and transferring money among the recruits inside the chain. Any significant level of bona fide retail sales have never been documented. Most important under the Settlement terms, Herbalife, not the FTC, must bear the burden of proving the existence of these mythical retail sales. Until now, the FTC carried that impossible responsibility of searching for what did not exist, and proving the absence of retail sales by extrapolating data among millions of churning individuals who are "independent" of the offending MLM enterprise. Could it be that Wall Street's reading of the FTC "tell" is wrong? Many observers were so skeptical of FTC's prosecutorial-will they expected the two-year investigation to conclude with a shameful white wash. They were happily proven wrong and have acknowledged the FTC for breaking a 30-year precedent in taking on Herbalife. There is also a plausible case to be made that the FTC has soberly recognized its historical dilemma and the impossible mission of "proving" retail sales as the anti-dote for an inherently deceptive endless chain business model, now called "multi-level marketing." And, rather than take on the MLM lobby directly and its paid friends in Congress, the FTC will just let the facts of Herbalife - the poster child of MLM - come to light and serve as a mandate and guide for law enforcement on all MLMs. If that is true, it is no wonder Herbalife has gone into full-blown denial. In the reality-based world where Unicorns, perpetual-motion-machines and "endless chains" don't exist Herbalife has no other option.